Kjelgaard is completely underrated. The only thing that might've improved this book would have been a longer resolution to solidify the happy ending. Even the portrayal of wolves didn't really bother me, because Kjelgaard made it fairly clear that this one wolf is just an a**hole. This story drew me in from the first page. The story focuses mostly on a young dog/puppy that, through a series of interesting, and tragic circumstances, grows up in the wild. His mixed genetics give him an edge in physical and mental capabilities (in a way that at least seemed realistic to me) that enable him to survive the challenges of life in the wild even from a young age.When a trapper gets a hold of him, though, the conflict begins as he tries to capture the dog's heart as well as its body. The story leads to a climax you won't expect, and goes from severely tragic to one of those endings that make you wish for a sequel (and, thankfully, that is where Wild Trek comes in). Good book for fans of The Call of the Wild or White Fang by Jack London!This is a smaller read probably categorized for middle grade readers, but nothing an adult couldn't enjoy as well. I read this book when I was younger, like elementary school younger. I was obsessed with wolves or any book that involved involved animals or fantasy settings. I'm pretty sure I picked this book up at one of the school book fairs (do they still do this?! ).I recently found out I'm pregnant, and anyone who has been pregnant knows that you can forget everything you know and love and who you are your 1st trimester - babies can be evil. SO, I could not nor did not want to read or do much of anything. I'm well in to my 2nd trimester now and recently started feeling more "normal" or about as normal as anyone with a watermelon for a belly could feel :PI decided I needed to ease my way back in to reading, so browsing through my shelves, I knew I wanted something small. The nostalgia this book brings me, I knew it would be my perfect bridge back into the reading world, and I was right!If you're into the books mentioned above, love animals/outdoors, I'd definitely recommend picking up this book as an in between read! This book is about a dog and her three newborn pups as they try to defend for themselves in the harsh winter months. It is an inspiring story about a dog having pups. The lone mom has to now find food for her pups when she is used to getting food from her owner. Her owner disappeared just days before she had the pups. Now she is stuck trying to catch food and defend her pups from any predators. Then the unthinkable happens. It is a very thrilling story.I would recommend this book to someone around the age of 13 to 15 and is intended for any gender. It is very easy to read and a great book. I think that anyone who read it in that age group would enjoy it. That is what I think about this book.I rated the book 5 stars because it was an inspiring story and about the tough life of a dog. I think every one who reads this book will enjoy it. It is one of the best books I have ever read. That is why I rated it 5 stars. I found this book boring at first. I don't really like reading about forests and boring stuff like that. I am not really interested in those types of books but this book reminded me of hatchet, which is a book I actually enjoyed. The lack of dialogue made this book boring but also unique. Jim Kjelgaard made it so that the whole book was descriptive which made it boring but it also painted a picture in my head. It was cliche with the whole dog-boy relationship but overall I don't really regret reading this. I probably liked this book way better when I was younger than I do now. Told from the dog's perspective. I'm not all in with some of his depictions of wolf psyche. If you compartmentalize that out, the story is told well. Another childhood favorite. I used to check this one out from our elementary school library again and again. Kjelgaard knew dogs, that's for sure. An excellent book. In the beginning of the book it was really slow and boring and never caught my attention and it never improved enough and I thought it was boring through out the book and didn't get that interesting. This is an amazing book about a wild dog whose goal is the avenge his family's death. Tense, exciting, and well-written, Kjelgaard makes this book come alive. In my opinion I really enjoyed the book Snow Dog by Jim Kjelgaard. I enjoyed this book because it shows just a lot of detail uses how the dog fought and hunted for his own just to survive. I enjoyed how the story is told from different people and then these stories turns into one whole story. The thing I enjoy the most was that the dogs mom died in a fight to save the life of the dog but later his brothers died because of the Wolf. Later he got stuck in a trap and a trapper found him in the snow. The trapper takes him as his own and and tries to tame him. The dog was a big help to the trapper when he went out to set his traps and hunting for food. But one day when the dog was hunting the trapper went to look at his traps and encounter the wolf who killed the family of the dog. The dog found the tapper and helped him as fasted as possible. The dog fought hard against the wolf ripping ,scrating, and cutting the wolf apart. When the fight was over the dog said that I will always take any life of any animal for my family. In conclusion I enjoyed this book overall and I wish to get it another book just like this one. This was a really good book full of beautiful imagery. Much of the book is spent from the perspective of Chiri the dog in the wild and it is quite a unique and wonderful technique and experience to read a book with little dialogue and instead just trying to get into the minds of the animals in the wild. Well written, very well done. Definitely would want to read another of his books. Only con? Felt like a strange place for an ending. Snow Dog was a book filled with exciting wilderness adventures and plot twists that kept me on the edge of my seat. Link, a fur trapper, lives a life in the wilderness with his dogs as his only companions. Link's greatest companion, a husky mix named Chiri, comes in and out of his life throughout the story. I would recommend this book to anyone who likes shorter reads about dogs and the wilderness. I love kjelgaard! This book is a 2 day quick read for me but I still love it. I have read his setter series(big red) and other Alaskan husky type books and I've never read a bad one from him! Seriously he's underrated and if you are on the edge about getting into his books... Well, you know what I'll say to that! I first read this book in Jr. High that was about 50 years ago. And I've got to say I think I enjoyed it just as much this time. I've always enjoyed books about the Alaskan wilderness. Looking forward to reading the followup "Wild Trek" which I've never read before. I really liked Jim Kjelgaard books when I was 4th or 5th grade. A solid writer. Better than Call of the Wild. Ok book about dog adventure. like dessert dog the beginning was super strong but then it just got really boring so i stopped reading it. My 7 & 10 yr old boys really liked this book. This was a book I started as a kid but never got around to finishing. After I picked up a vintage copy at a library book sale, I discovered why: the main human character is a fur trapper, taking part in an industry I find both barbaric and wasteful. However, as I have matured over the years, I have come to realize it is good to read about people unlike oneself. At the very least, you’ll learn something about another style of thinking, and at best you’ll develop more compassion for your fellow humans. This time, I stuck with it, and I’m glad I did.At its best, Snow Dog is reminiscent of White Fang or Call of the Wild. Like these books, I find no reason it should be classified as “children’s fiction.” The trapper, Link Stevens, is about nineteen when the story begins, which in my mind should make it YA. Granted, the prose is more complex and better written than almost anything coming out of that market today, and Link is independent without being an impossibly gifted brat. Plus, there are no tedious love triangles. This is a simple, unadulterated adventure story which needs no romance or paranormal activity to stand on its own four legs.As mentioned before, this is similar to a Jack London story, so expect no heart-warming fluffiness. This is an often brutal coming-of-age story, particularly in regards to Chiri, the titular snow dog. While some of the animal behavior is questionable, Kjelgaard excels at placing readers in his animal characters’ minds. The woods come to vivid life from their perspectives. Link Steven’s portions were a little weaker, as he tends to tell more than show, but did a serviceable job moving the plot. Structurally, the book seemed a little loose and rushed towards the end, but that is my only real complaint.All in all, this is a good, old-fashioned adventure which should be enjoyable for more readers than just children. As mentioned before, this book is often brutal. Keep the time period in mind as you read. Nowadays, capable horse and dog trainers would never advocate the use of clubs, and sending most teenagers into the wilderness on their own is probably not a good idea. Wow! I always thought that Jack London was the undisputed patriarch of animal survival stories. That was until I read "Snow dog." In a gripping, yet hauntingly tragic tale of wilderness adventure, Kjelgaard seamlessly intertwines the stories of Chiri and Link; separate until together. 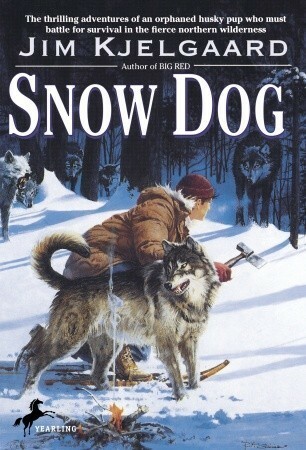 I thoroughly enjoyed "White Fang" and "The Call of the Wild," and frequently discuss them with my class during our genre discussions, but Kjelgaard has supplanted London as my favorite author of these unique stories. I cannot wait to read his other books! Is a great story that I haven't read since I was twelve, all the dog stories by this author fascinated me as a kid. The story is interesting enough to keep a kid entertained but still good enough that I enjoyed reading it as an adult. A great book for any kid who likes stories about animals. This book will always be my favorite wild dog adventure book. I remember checking this one out of the library a dozen times when I was younger. Focusing mostly on the wild-born dog, Chiri, it is a classic tale of survival. Throw in a cunning large wolf that has wronged Chiri, and you know there is going to be one hell of a final battle between the two. Mixed in is the story of a trapper, Link Stevens, and how his story ties in to Chiri's life. In comparison to Big Red, another one of Kjelgaard's books, this book did not follow just the story of the man, and how everything relates to him. I think that's why I like Snow Dog so much better.